Chapter 6 of the Su Wen introduces the concept of channels “opening onto the exterior” (or being the “opening”), closing onto the interior (or “being the door leaf”) and being the pivot (or hinge). With regard to the Yin channels I personally see the Jue Yin as the pivot (I call it “hinge”) and the Shao Yin as opening onto the interior (or “closing”). There are various reasons for this. Firstly, if we read chapter 6 of the Su Wen in full and we look at the context of the exterior/interior/hinge quote, we will see that things are not quite as they seem. It sounds like this chapter is talking more about Zangfu organs than channels and more about the trunk and abdomen than arm or leg channels. Secondly, the very same chapter also says: “The vessel behind Tai Yin is Shao Yin. The vessel in front of Shao Yin is Jue Yin.” Therefore, Tai Yin is in front of Shao Yin and Jue Yin is in front of Shao Yin: this means that Jue Yin is in the middle between Tai Yin (the ‘front”) and Shao Yin (the “back”). That sounds very much like the Jue Yin is in between the Tai Yin and the Shao Yin, i.e. it is the “hinge”. Moreover, when it talks about the Yang, chapter 6 says: “The vessel outside the Jue Yin is the Shao Yang.” As the Shao Yang is the hinge of the Yang, it being “outside the Jue Yin” would imply that the Jue Yin must be a hinge too.Of course the Shao Yang (Triple Burner and Gall-Bladder) have a Yin-Yang connection with the Jue Yin (Pericardium and Liver) and that is why this chapter says that the Shao Yang is “outside” the Jue Yin. Thirdly, the book “Great Treatise of Chinese Acupuncture” (Zhong Guo Zhen Jiu Da Quan) by Wang Xue Tai uses similar terminology when it refers to “front”, “middle” and “back” of channels, which I would translate as “lateral”, “middle” and “medial”. This book confirms that the Jue Yin is in the “middle”. This is reflected all over the body in the situation of the channels (with the exception of the lower leg). For example, if we look at the chest, we have the Spleen channel (Tai Yin) outside (lateral), the Kidney channel (Shao Yin) inside (medial) and the Liver channel (Jue Yin) in between. The same in the abdomen. This is even clearer in the arm where we have the Lung channel (Tai Yin) on the lateral side, the Pericardium channel (Jue Yin) in the middle and the Heart channel (Shao Yin) on the medial side. Only the lower leg represents an exception as the Liver channel (Jue Yin) is on the lateral side initially but it crosses over in the middle of the lower leg. 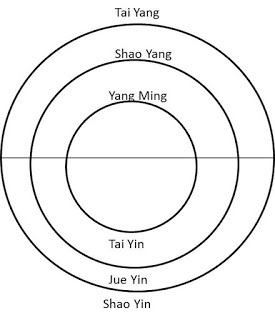 Thus, if Shao Yang is the hinge of the Yang channels, then the Jue Yin must also be of the Yin channels because it occupies a corresponding place in the Yin as that of the Yang. If we bear in mind the Yin-Yang connections among channels, the Triple Burner (Shao Yang) is connected to the Pericardium (Jue Yin) and the Gall-Bladder (Shao Yang) to the Liver (Jue Yin). Therefore, if the Shao Yang is the hinge of the Yang (as it clearly is), then the Jue Yin must be the hinge of the Yin. The diagrams below illustrate this concept. 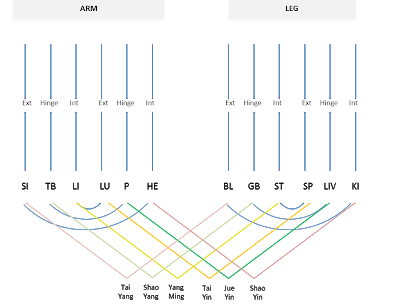 The two diagrams below show the position of the channels in arms and legs as indicated above. The diagram below shows clearly how, if we related the concept of opening/closing/hinge to channel topography, the Jue Yin must be the hinge. Notice how the Heart and Kidney channels are both medial, both “inside”, both the “most interior” (and therefore not pivot or hinge) of the Yin channels. What is the clinical significance of all this? In my opinion, the clinical significance is more relevant for the Yang than for the Yin channels. If we look at the Yang channels, it is very obvious why the Tai Yang “opens onto the Exterior”. Its channels are lateral, on the outside and cover the very Yang area of back of the neck and back. Not by chance, the first stage of the Shan Han Lun is the Tai Yang stage and not by chance this stage is marked by occipital stiffness (Tai Yang area). 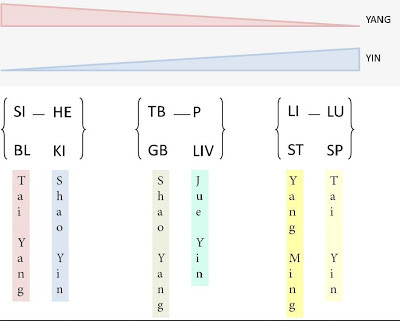 That the Shao Yang is the hinge between Tai Yang and Yang Ming is also clear from the Shang Han Lun. The Shao Yang Syndrome is characterized by the alternation of feeling cold and feeling hot. This is due to the fact that the pathogenic factor is trapped between the Tai Yang (exterior) and the Yang Ming (interior): when it floats toward the Tai Yang, the patient feels cold; when it goes to the Yang Ming, the patient feels hot. In my view, however, the most important clinical significance of the concept of “hinge” is in the field of mental-emotional problems. This is a view according to my experience and not according to Chinese texts. I see the role of “hinge” of the Shao Yang and Jue Yin as a metaphor of their involvement in relationships, in our relating to others. All four of the Shao Yang and Jue Yin channels play a role in relating but especially so the Jue Yin, i.e. Pericardium and Liver. The Liver even more so because it houses the Hun which provides the Shen with the “movement” necessary to relate.